Rich, deep soil with plenty of compost dug in is best but will grow in most positions. Basil, Marigold, Peas, Squash, Aubergine, Sage, Beans, Coriander and Horseradish. Grow from seed potatoes. Chit them by leaving on cardboard or eggboxes in a light position until they have produced short green sprouts. Plant out in early to mid spring. As shoots appear, draw soil over them if there is still a possibility of frost. Once the shoots are hand height, earth them up by drawing more soil around them leaving the top of the shoots still showing to keep the actual potatoes covered. If any potatoes get exposed to light and turn green they should not be eaten. Make sure potatoes are kept watered in dry weather. 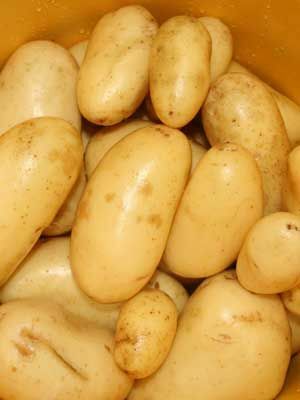 The earliest potatoes can be harvested when the plants begin to flower. Once the foliage has wilted harvest the main crop within a couple of weeks, digging in from the side to avoid damaging the tubers.